Because I object to Black Friday’s commercialism — and the media-fueled, undignified behavior it provokes each day-after-Thanksgiving — I avoid the annual retail hoopla at all costs. I usually hide out at the movies… along with thousands of other agoraphobic Bay Area residents. Amazed that we’d all forego spending Thanksgiving night on the sidewalk, just for the remote (pun intended) chance of buying a 52” HDTV at a steep discount on Friday morning? Speaking for myself, I’ll pass. I prefer holiday cocktails in a glass not a thermos, and generally avoid turkey and stuffing that has been stored in a beer cooler. So, I spent Thanksgiving with friends. And on this Black Friday, I squeezed into my yoga pants with the elastic waistband (damn you, pumpkin bread pudding!) and drove to the ‘burbs to see Steven Spielberg’s historical drama Lincoln. 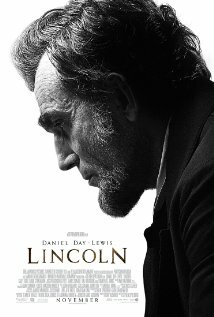 Everything you’ve heard and read about the film is true; Daniel Day-Lewis is an incredible Abraham Lincoln. He is tall and gangly, with a beard and worried wrinkles. He IS Lincoln — so much so that for the rest of my life his will be the face I see when I picture America’s 16th president. It is a great film, and I found it extremely engrossing despite its two-and-a-half hour run time. Yet, I was a little distracted by Lincoln’s voice. Knowing the President’s physical stature and tremendous accomplishments, one might assume that he had a deep, booming, commanding voice. No so, apparently. Filmmakers did their homework, and based on historical records Day-Lewis went with a soft, reedy voice for Lincoln. Much has been made of this in the press, so I was practically expecting to hear Pee-wee Herman. It wasn’t that extreme. Besides, the deepness of Day-Lewis’s voice wasn’t the distraction. It just reminded me of someone. But who? It took nearly an hour for it to hit me. 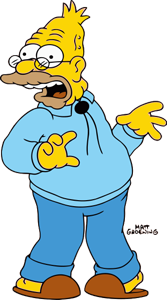 Daniel Day-Lewis’s Lincoln voice sounds just like… Grandpa Simpson. ABRAHAM Simpson, that is. You know, from The Simpsons? I kid you not; His name is Abe. (Is he honest? Wikipedia doesn’t say.) And just like President Lincoln, Grandpa Simpson tells stories and anecdotes that others sometimes find tedious and/or pointless. Coincidence? Click the link. See the film. Judge for yourself. Am I wrong? I like Adam Gopnik’s comment that DDL’s Lincoln reminded him of James Taylor.